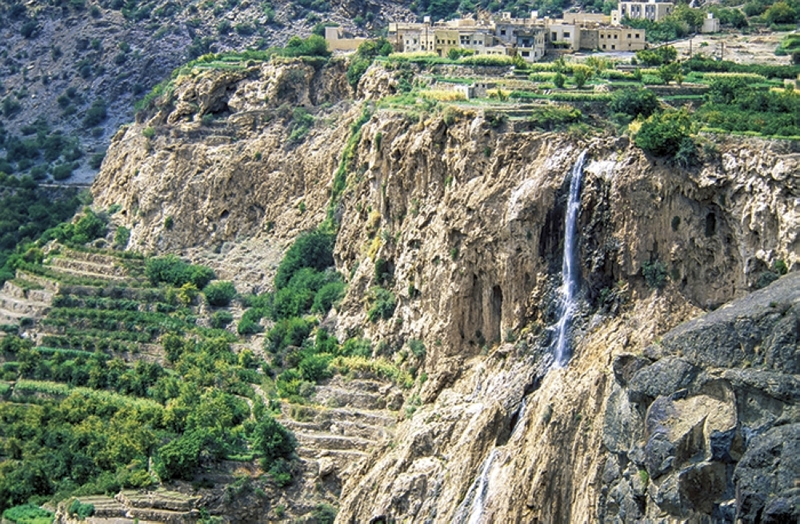 Whether you are a weekend reveller out on a sightseeing trip or an adventure traveller seeking to rough it out, the lofty mountain ranges of Jabal Akhdar will fill you with a sense of contentment that comes from a task accomplished. Acting as a muse to set you yonder on trysts with nature; treating your senses with the majestic landscape and its unique flora. Its stunning nature laden vista is designed to satiate every traveller/visitor’s tastes – more so for adventure travellers now that Anantara Al Jabal Al Akhdar Resort has an all new option. For, taking adventure to new heights is the Resort’s new activity wall. 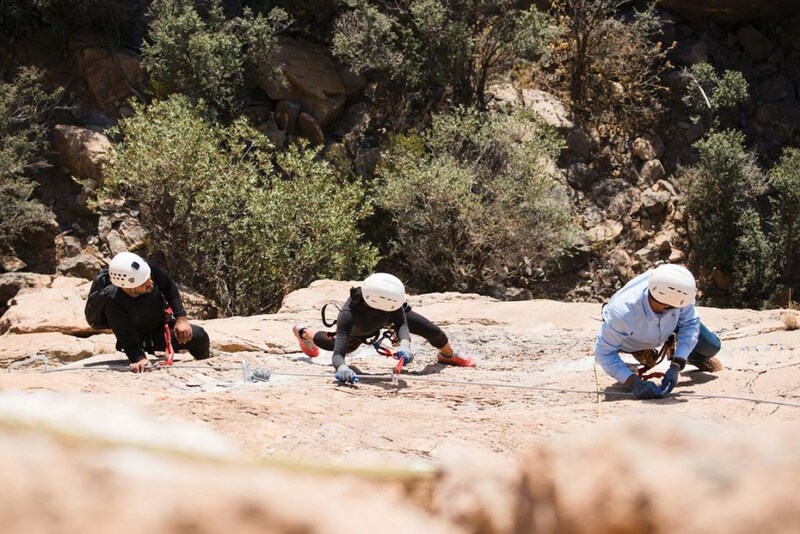 It has added an advanced phase to its mountain climbing experience, incorporating nearly 200 metres of via ferrata snaking across the cliff edge as well as Oman’s first mountain zip lines. The Ultimate Jabal Activity Wall is not for the fainthearted as the new climbing route is one of the highest in the Middle East, providing intrepid travellers with a brand new way to experience Oman’s Green Mountain and its expanse of craggy cliffs and limestone rock formations. Meaning ‘iron road’ in Italian, the via ferrata course comprises a series of steel cables that wrap around the mountain side, offering an unsurpassed view of the vast valley from an exhilarating, and otherwise inaccessible angle and providing perfect photo opportunities. Designed with the highest European safety standards, the new course ranges from entry level to advanced, ensuring it is suitable for all abilities, with a series of escape routes allowing any uneasy climbers to quickly ascend back up to the mountaintop. A team of certified instructors, trained by a highly experienced British mountain guide, are on hand to assist climbers as they attach themselves to the cables using a waist harness and a locked carabiner system, dispensing with the need to clip and unclip for extra safety. The adventure then begins, as climbers use their hands and a series of strategically placed metal steps to trace their way along the vertical rock face, before navigating jagged rock formations, ladders and vertical stairs. Below, a vast canyon plunges to 1,000 metres at its deepest point, providing climbers with a front row seat as they soak in the peaceful silence. Towards the end of the hour-long climb, two zip lines suspended high above the canyon allow thrill seekers to fly through the air for the ultimate adrenaline rush. Surrounded by majestic mountains and enjoying cool temperatures throughout the year, Anantara Al Jabal Akhdar Resort presents couples and families alike with a range of authentic mountain escapes and experiences. Guests looking an adventurous getaway can take advantage of the resort’s exhilarating activity programme and immerse themselves into the rich local heritage and landscape. Those looking for a more relaxed affair, or simply want to unwind after a day of adventure, can do so the resort’s world-acclaimed Anantara Spa, which harnesses the essence of Arabia and boasts ancient hammam rituals. Those looking to add an element of adventure to their stay at Anantara Al Jabal Al Akhdar Resort can book the beginners Jabal Activity Wall, which includes a 90 minute session with expert guidance from two certified instructors. Each session will have a maximum of four clients per group, aged nine years and above, with the maximum weight of 100kgs. More experienced climbers can book The Ultimate Jabal Activity Wall, which includes a two-hour climbing session with expert guidance from two certified instructors. This is also for a maximum of four clients per group, aged sixteen years and above. He loves most things including visiting new places, admiring nature, shopping and catching up with friends over a cup of tea. An avid reader, always carries a book around to keep his company. © 2019 - ExpatsMuscat. All Rights Reserved.